NGO BILL 2016: Do you think Nigeria needs this law? Defines NGOs in Section 57, Part 7 ‘to be a private voluntary grouping of individuals or associations not operated for profit of for commercial purposes, but which have organised themselves nationally or internationally for the promotion of social welfare, development, charity or research through mobilisation of resources’. It is important to recall that the 2016 NGO Bill is not the first attempt at regulating NGOs in Nigeria. In 2014, Honorable Eddie Ifeanyichukwu Mbadiwe presented a similar bill before the 7th Assembly, then tagged, ‘A Bill to Regulate the Acceptance and Utilization of Financial/Material Contributions of Donor Agencies to Voluntary Organizations’. The former bill aimed to curtail NGO access to, and use of funds. “Do you think Nigeria needs this law (NGO Bill 2016)?” This was the theme of an online conversation that SPACES FOR CHANGE hosted and moderated in its Discussion Forum on August 29, 2016. The dicussions provoked a fierce debate regarding the shrinking spaces for civil society engagement vis-a-vis the propriety of non-profit sector regulation in Nigeria. 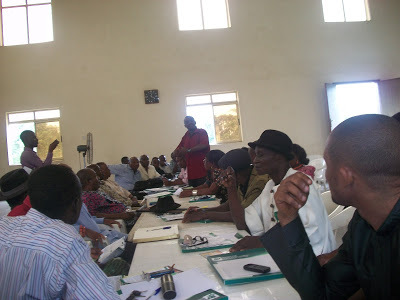 Members of the Forum like Ishaya Amaza, Pat Dell, Chudy Okonkwo, Akinleye Akinkunmi Segun Bishop, Ifeanyi Enemuo, Wale Edun, Obia Nuju) argued that NGOs should be regulated to ascertain the source(s) and purpose(s) of the funding they receive in order to prevent money laundering, threats to national security, and to promote transparency and accountability through public records-keeping. Along these lines, extant laws should be amended to accommodate present realities and agencies strengthened to enhance enforcement. A needless duplication of provisions and regulatory functions espoused in extant laws such as the Companies and Allied Matters Act (CAMA)1990. “Should the Bill be passed into law, does that automatically abrogate or repeal CAMA 1990”, Victoria Ibezim-Ohaeri asked. An unhealthy environment for NGOs to operate and serve as watchdogs. Unrealistic and onerous requirements for NGO registration and renewal of registration every two years, etc which could be an attempt to stifle civil society groups and organizations that are not in the good books of the government. There were other contributors like Ena Ofugara and Chudy Okonkwo which opined that the Bill could in reality, be a backdoor regulation for specific organisations such as religious bodies e.g. churches, and campaign movements like the Bring Back Our Girls (BBOG) among others. This sort of sentiment clearly evinces the extent of mistrust for the legislative intent underlying the Bill, as well as public aversion for abuse inherent in such legislations. Coming at a time when Nigerian citizens are incrementally taking an active interest in governance, spurred by advancements in digital technology and diverse NGOs activities, the latest renewal of the attempt to use legislation to regulate the civil society was questioned on several grounds. First, NGOs enter into contracts with their donor organizations. Imposing the government as a partner in the contract between two entities potentially constitutes a breach of privity of contract that exists between project partners ( i.e. the donor and NGO beneficiary). Secondly, many were concerned about the duplication of laws and/or provisions on similar matters. For example, the requirement for audit of grants which is already a requirement under the Companies and Allied Matters Act, Chapter C21, Laws of the Federation of Nigeria, 2004. NGOs also report to the Federal Inland Revenue Service, as well as comply with technical international/national Project Audit Reporting Frameworks as contracted. In addition, the commercial laws of the land require the lifting of the veil of incorporated bodies whenever it becomes necessary to investigate claims of financial impropriety. The State and Federal High Courts, the Corporate Affairs Commission (CAC), Economic and Financial Crimes Commission (EFCC), the Independent Corrupt Practices Commission (ICPC) among others, are some of the numerous agencies that interpret and/or execute the relevant laws, and are statutorily empowered to investigate claims of financial misconduct against any corporate entity in Nigeria. For the above reasons, perception is growing that an additional law to replicate these legal provisions and regulatory functions looks like an over-regulation of the non-profit sector. For SPACES FOR CHANGE, discussions like this will continue, and ideas collated will be developed into a strong response to the Nigerian parliament. While acknowledging that the need to prevent threats to national security within the country is a legitimate one, we however, take the view that that objective needs to be undertaken in a way that does not trample on constitutionally-protected rights and freedoms.